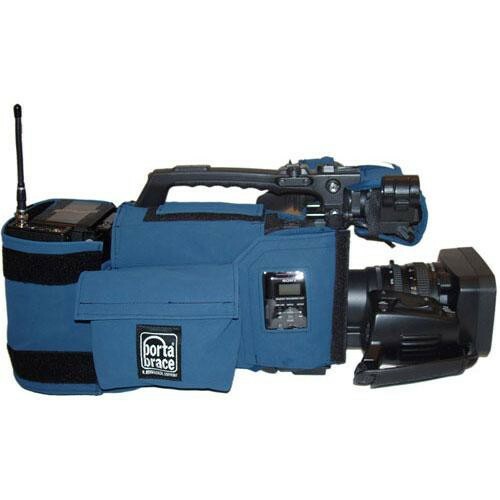 The Porta Brace CBA-S270 Camera Body Armor (Signature Blue) is a snug- fitting camera cover made of water-resistant, highly abrasion-resistant, soft-feel fabric that protects a Sony HVR-S270 camcorder from bumps, hits and scratches. It also reduces the risk of camcorder damage due to precipitation, dust, and other harsh conditions. The armor includes a built-in Rain Top; the top is white (reflective) on one side for hot, dry, sunny situations while the black side is useful to absorb the sun's warmth under cold conditions. The camera body armor is loaded onto the camera using touch fasteners and web cinchers. An HB-40CamC shoulder strap is included. Box Dimensions (LxWxH) 10.9 x 9.7 x 8.0"